Amorphous shapeshifting blobs, winged children, and giant flying bears, oh my. 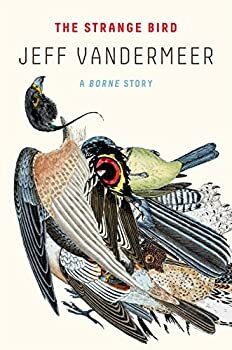 Jeff VanderMeer’s Borne (2017) is a lyrical and lovely novel whose stylistic aplomb, weird inventiveness, and great heart more than compensate for what might have ordinarily been noted as flaws in the book. Sure, there are issues, but I loved nearly every minute of Borne, and if it hadn’t come in the same month I’d finished the exceptional City of Miracles and A Gentleman in Moscow, it would have been my best read of the month. 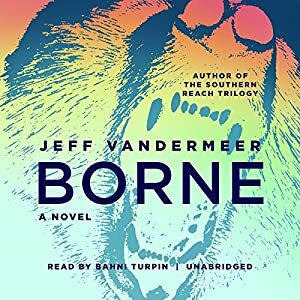 Borne is told from the first-person perspective of Rachel, a scavenger trying to survive a post-apocalyptic world in the near-ruins of a city ruled over by a Godzilla-sized flying bear named Mord. The city is home to The Company, a once powerful and mysterious biotech organization that created Mord and then, as almost anyone could have predicted, was destroyed by him. Mord alone is inventive enough (how does he fly? Who knows? Who cares?). 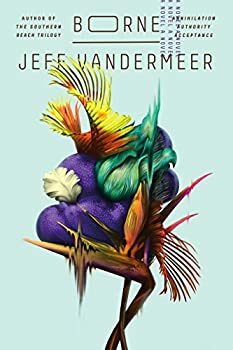 But VanderMeer rarely settles for the “normally weird,” and so he adds the twist that people follow Mord in order to scavenge the flotsam and jetsam that gets stuck in his fur as he travels the city. Sometimes they just wait for it to fall off; other times that scale his mass as he sleeps, searching for something of value. In one of her scavenging trips, Rachel finds, well, she’s not sure what it is. At first she thinks it (looking like a “half-closed stranded sea anemone”) is a plant, then a dumb animal, then, as becomes clear, something more. Rachel is intrigued, her roommate Wick (who once worked for the Company) more worried, especially as Borne starts to demonstrate several traits: speech, an accelerated growth rate, intelligence (though with the knowledge of a young child), shapeshifting, and most worrisome — the ability to absorb or “sample” living things. Borne then becomes several books as it moves forward. One is a post-apocalyptic novel that makes use of all that genre’s tropes (in original fashion): ecological disaster, refugees, distrust, scavenging, a dog-eat-dog ethos (balanced, as is often the case in other such works, with moments of surprising — and thus all the more effectively moving — kindness and compassion). It’s also a mystery. Or several mysteries. Who/what is Borne? Where did he come from? Who created him and for what purpose? Why did Wick leave the Company? What is the Company and where did its advanced tech come from? Who is The Magician (a mysterious figure seeking to reclaim the city from Mord)? Even Rachel’s own muddled memories of her refugee childhood offer up a potential mystery. Borne is also possibly a love story (Wick and Rachel), though VanderMeer expertly keeps us dancing on the edge of that one, portraying their relationship with all the complexity one would expect of any such pairing in a world such as this. But perhaps most centrally, it’s a story about being a parent. For Borne is the quintessential blank slate per Rousseau’s view of childhood. He “absorbs” everything, not just matter but information, ethics, emotions. Always growing, evolving, questioning. His name itself is a clue to this aspect, as Rachel tells us she “bore” him. As are Borne’s questions, which any beleaguered parent will recognize as all too familiar (“why is water wet?”). At first VanderMeer is content to let the reader themselves make these connections, as for instance when she early on treats him first as a house plant, then as a pet, and finally as more, as she reads to him, tries to teach him the difference between right and wrong. I realized right then in that moment that I’d begun to love him. Because he didn’t see the world like I saw the world. He didn’t see the traps. Because he made me rethink even simple words … That was the moment I knew I’d decided to trade my safety for something else. That was the moment … I had crossed over into another place. As Borne progresses, the parenting theme becomes ever more explicit even as it becomes more emotionally fraught, culminating in Rachel’s simple declaration: “I’m like a mother to Borne … He’s like my child.” Which is a good decision, I think, since as the parallel grows ever more clear, keeping it unnamed just starts to seem overly cute. Besides, such direct acknowledgement allows for yet another shift in their relationship. Because, of course, children don’t “not see the traps” forever. Nor do they stay home. They begin to want to explore the wider world. They start to wonder who they are, who they might turn out to be. Soon Rachel and Borne’s conversations are more and more complicated, eventually Borne decides he needs to “move out” — first down the hall and then, later, for reasons I won’t spoil, even farther. Beyond the book’s mature themes, it’s filled as well with a wild inventory of creativity — feral children with “gossamer wings,” Mord “proxies,” intelligent foxes, minnows that act as cocktails, biotech camouflage robes, beetles that when “shoved in your ear … could rid you of memories and add memories … someone else’s happier memories from long ago, from places that didn’t exist anymore.” Some of these, such as the children, come and go a bit too quickly, or are dropped without being on stage long enough for full impact, such as The Magician. But these flaws pale beside the emotional heft of the relationships in the book — Rachel and Borne, Rachel and Wick — as well as the larger issues explored in the novel. The ways in which we impoverish ourselves and our world. The ways in which that world will respond in ways we cannot anticipate or even, perhaps, cannot even comprehend as “response” (themes found as well in VanderMeer’s excellent SOUTHERN REACH trilogy). What it means to be human. How we react when faced with the inhuman. Thanks to those few flaws, Borne is not a perfect book. But thanks to the way it moves the reader’s heart, provokes the reader’s mind, and thanks as well to its literarily lyrical language, it edges up pretty close to being a great one. I loved this one, too. The audiobook version produced by Blackstone Audio and narrated by Bahni Turpin is fabulous. She does a great job with all of the characters, but I loved her portrayal of Borne best. She added to my enjoyment of this imaginative story which, by the way, reminded me a little of Margaret Atwood‘s Oryx and Crake. The audiobook is 12 hours long. Published May 2, 2017. Named one of the most anticipated books of 2017 by The New York Times, The Huffington Post, Book Riot, Chicago Reader, The Week, and Publishers Weekly. “Am I a person?” Borne asked me. “Yes, you are a person,” I told him. “But like a person, you can be a weapon, too.” In Borne, a young woman named Rachel survives as a scavenger in a ruined city half destroyed by drought and conflict. The city is dangerous, littered with discarded experiments from the Company—a biotech firm now derelict—and punished by the unpredictable predations of a giant bear. Rachel ekes out an existence in the shelter of a run-down sanctuary she shares with her partner, Wick, who deals his own homegrown psychoactive biotech. One day, Rachel finds Borne during a scavenging mission and takes him home. Borne as salvage is little more than a green lump—plant or animal?—but exudes a strange charisma. Borne reminds Rachel of the marine life from the island nation of her birth, now lost to rising seas. There is an attachment she resents: in this world any weakness can kill you. Yet, against her instincts—and definitely against Wick’s wishes—Rachel keeps Borne. She cannot help herself. Borne, learning to speak, learning about the world, is fun to be with, and in a world so broken that innocence is a precious thing. For Borne makes Rachel see beauty in the desolation around her. She begins to feel a protectiveness she can ill afford. “He was born, but I had borne him.” But as Borne grows, he begins to threaten the balance of power in the city and to put the security of her sanctuary with Wick at risk. For the Company, it seems, may not be truly dead, and new enemies are creeping in. What Borne will lay bare to Rachel as he changes is how precarious her existence has been, and how dependent on subterfuge and secrets. In the aftermath, nothing may ever be the same.